Simply put, sunburn is a skin inflammation that can have serious consequences if it occurs repeatedly. A sunburn is the result of overexposure to harmful ultraviolet (UV) radiation from the sun or overuse of an ultraviolet tanning lamp or tanning bed. The eyes also incur damage from a burn. 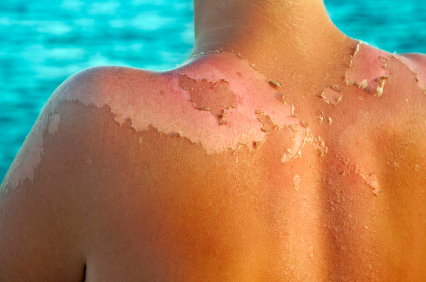 In the United States, sunburns are extremely common. The Centers for Disease Control and Prevention (CDC) estimate that about 50% of adults between the ages of 18 and 29 have had one sunburn, if not more, within the previous year. Frequent sunburns, however, put you at risk for developing skin cancer. The sun’s UV rays are the most intense (and therefore the most damaging) in the middle of the day, between 10AM and 2PM. Initial signs and symptoms of sunburn are skin that is red, tender and hot to the touch. The skin can also be painful when touched. In some cases, an individual can become dehydrated with a sunburn. Subsequently, the skin may blister, appear swollen, and eventually peel following the burn. Lots of sunburns are quite mild. You can easily treat this by applying cold compresses to alleviate surface pain, or by soaking in a tepid bath followed by carefully drying the skin. Additionally, you can apply soothing lotions to moisturize the skin that was burned. Non-prescription pain relievers can also help with the pain, like ibuprofen or acetaminophen. Sunburns can cause long term damage to the skin, including varying types and degrees of skin cancer. Basal cell carcinoma (BCC), squamous cell carcinoma (SCC), and malignant melanoma are all caused by repeated sunburns. The sun’s UVB rays can cause skin damage, but the UVA rays are the worst ones. Sun rays are capable of bouncing off of water, snow, sand, and other surfaces. Some individuals will tan after being exposed to ultraviolet rays. After many prolonged exposures to the sun, their skin makes more melanin (the substance that gives skin color). People who have certain types of pigment disorders, and those with fair skin colors, are at the greatest risks for getting sunburns. Some conditions and diseases put people at an increased risk of sunburns, such as lupus, albinism, xeroderma pigmentosum, vitiligo, and porphyria. Certain drugs can increase photosensitivity (sensitivity to the sun). The most effective way to keep from getting a sunburn is to avoid prolonged sun exposure. Sunscreen and protective clothing are very important ways of limiting sun damage. Sunscreen (at least SPF 30) should be applied liberally before going outside and re-applied often after swimming or excessive sweating. A condition known as sun poisoning can result from a severe sunburn. Symptoms and signs can include nausea, fever, chills, rapid heart rate, rapid respirations, dehydration, dizziness, and ultimately shock. A severe life-threatening form of hyperthermia is referred to as heat stroke. What’s the Harm in Getting a Sunburn? It has been proven that your chance of developing melanoma, the most serious form of skin cancer, increases by 100%, if you had five or more sunburns in your lifetime. A single instance of serious blistering sunburn, occurring in either childhood or adolescence, doubles your probability of getting malignant melanoma later on in life. Basal cell carcinoma and squamous cell carcinoma are the two most prevalent types of non-melanoma skin cancers. Both correlate directly with multiple sun exposures over many years. Also, melanoma is more likely to occur on skin that has been burned by the sun repeatedly. What Types of Skin Cancer Occur from Sunburns? The most common areas of the body for basal cell carcinoma and squamous cell carcinoma to develop are the ears, face, and hands. Generally, these are the parts of the body that get the most sun exposure. That being said, it is possible for these two skin cancers to occur on areas of the body that have not been exposed to the sun. However, melanoma can occur almost anywhere, regardless of sun exposure. The pattern of sun exposure thought to result in melanoma can be one short, intensive exposure (a severe blistering sunburn), as opposed to many years of sun tanning. Skin cancer researchers found that basal cell carcinoma can also be triggered by this type of isolated sun exposure. Other risk factors associated with melanoma development are family history, certain skin types, and the occurrence of many large moles on the body. What’s the bottom line? It is simple: Do not get a sunburn! Dermatologists advise that you examine your skin from top to bottom every month for any abnormalities. Consult your doctor immediately if you find anything that concerns you. Also, get a yearly professional skin exam.